No job is too big or too small for us! We prove this principle of ours on a daily basis! Fantastic Handyman was requested to add a final touch of usability to a double wardrobe - fit two handles. Adding handles to a wardrobe not only makes it more convenient to use, but also aesthetically changes the look of the wardrobe. 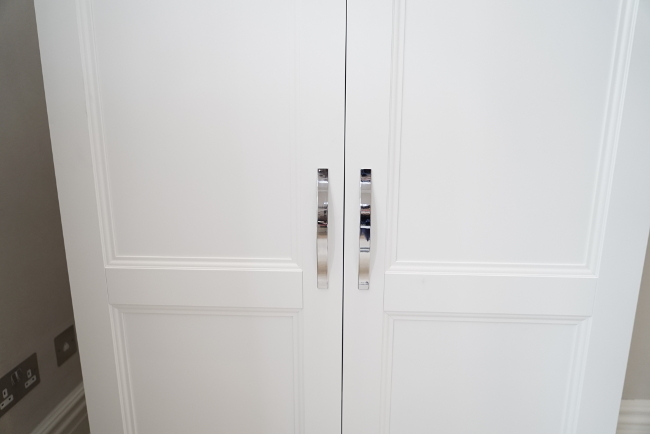 Originally, the customer’s wardrobe was manufactured without door handles. And the handyman in Lewisham was entrusted with the task to professionally and efficiently install the handles. The handyman was aware of how important it was to take measurements correctly, in order to complete the job successfully. It was the first thing any experienced handyman would start with. Since the job was pretty straightforward, all it was required was to use a standard ruler tape and a pencil and mark the holes where the screws were going to be inserted on the door. Next step - the handyman drilled the holes from the outside of the door inwards. It was done this way because the end of the drill bit could chip away small bits of wood. It’s highly recommended to hide the imperfections on the inside of the door, so they are not visible to the casual observer. Afterwards, the technician ran the drill bit through the holes from the inside of the door to expand the holes. The same process was repeated with the other door. Eventually, the handyman attached the handle and firmly screwed it down to the door. Again, the same was done for the other door. As a final touch, the technician hid the screw heads by placing screw cover caps over them. The customer ended up with an outstandingly looking and easy-to-use wardrobe in no time! 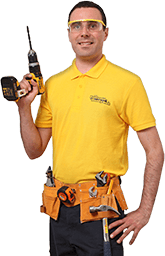 Ready to Order a Handyman Service?